While any type of fruit can serve as an important component in a healthy diet, some fruits are more beneficial than others. Bananas offer plenty of positive nutritional value per serving, but their relatively high calorie and sugar amounts mean that it might be best to enjoy them in moderation. According to the USDA, one large banana has more than 120 calories. While that still makes it a low-calorie snack in comparison with a large cookie or bag of chips, the fact remains that a banana has nearly three times the calorie count of a cup of diced watermelon and six times the calorie count of a 3-cup spinach salad without dressing. Since extra calories manifest themselves as extra pounds, eating bananas on top of your regular daily diet might promote gradual, unwanted weight gain over time. As Dr. Melina Jampolis, physician nutrition specialist for CNN.com, points out, fruits tend to have nearly three times the caloric value as nonstarchy vegetables, which makes them more likely to contribute to weight gain. Compared with other fruits and vegetables, bananas have a relatively poor shelf stability. Green and firm yellow bananas will stay ripe for several days after you buy them, but as the Centers for Disease Control and Prevention points out, you can prolong the shelf life of ripe bananas for only three to five days in the refrigerator. In contrast, apples store for up to six weeks. Bananas have relatively high sugar contents in comparison with other natural foods, which contributes to their glycemic index and glycemic load values. A large banana has more than 16.5 g sugar, which is a mixture of sucrose, glucose and fructose. According to Harvard Medical School, a ripe banana’s glycemic index is 51 and its glycemic load is 13, higher values than those for apples, grapefruits, grapes, oranges, peaches or pears. When a food has a higher glycemic index and glycemic load, you are more likely to experience spikes in blood sugar and insulin levels after you eat that food. However, bananas' glycemic index value is not nearly as high as values from baked goods and desserts that include refined sugar. 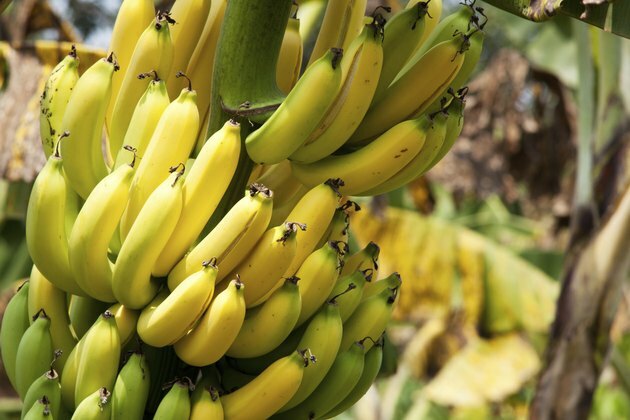 It’s important to look at bananas from a balanced perspective and understand that they also have many advantages, including high potassium and fiber contents. Rather than avoiding them altogether, it can be healthy to include them in moderation in your diet along with a mixture of other fresh fruits and vegetables, lean proteins, low-fat or nonfat dairy products and whole grains. For individual nutrition guidance, see your doctor or a registered dietitian. Is Eating Too Many Bananas Bad for You?